We have a small tradition in our house. Every year when the temperature drops significantly in the evening, mornings are a little colder, and even though it’s sunny in the day there’s still that cold in the air… that’s when we know it’s time to make some chili. My husband actually started this tradition some years ago in the beginning of our relationship. 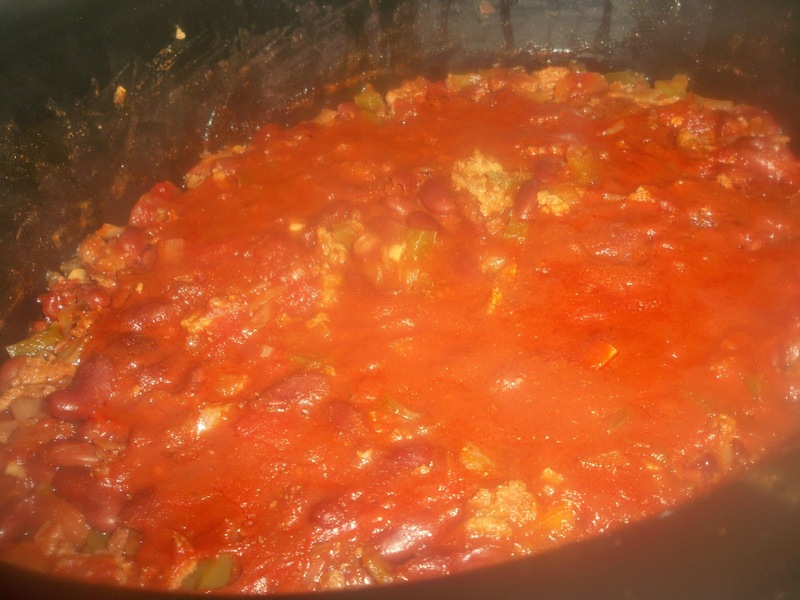 He’s always one for a hearty meal, and what once started from a couple huge cans of chili and a box of Jiffy mix and adding our own seasonings and vegetables to the chili, has turned into something completely our own creation. One Christmas my mom gifted me with a slow cooker. This was around the time when I really started getting into cooking meals and experimenting. I had told her I really wanted one, and I’d seen various recipes and knew they were great for stews and soups. So she brought a dish with her she made in the crockpot for Christmas, and as my gift told me the crockpot that it was in was my gift! Ever since then I have been enamored with my slow cooker and I’m always looking at different things to make with it, and I think this season I’ll be purchasing a second one! 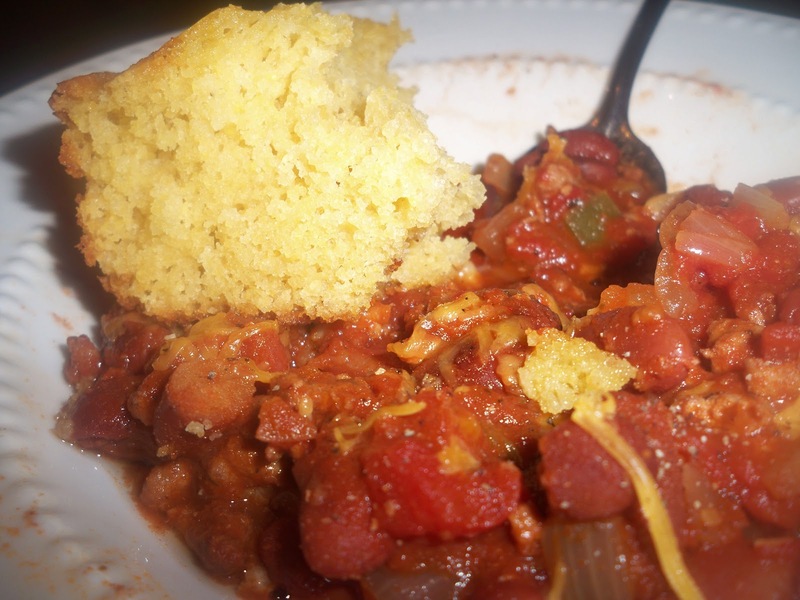 Considering our tradition of chili and cornbread during the cold seasons, this was one of my first experiments. 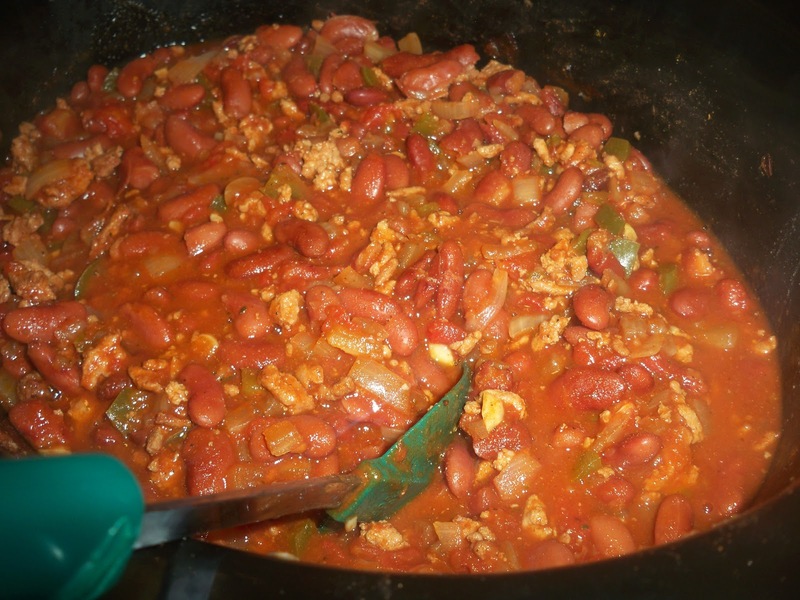 I’ve been making this for a few years now and never really measured things, just kind of threw in what I felt like adding, so sometimes based on my mood my chili can be very spicy, and sometimes it’s very mellow. The last time I made it I was sure to write down the ingredients and measurements so I could add this recipe in my collection here. This one isn’t as spicy, so if you like more heat, you can double some of the hotter spices. I will have my cornbread recipe up in a few days that goes along with this and is pictured here. Stay tuned! Cook the dried beans as directed. Do the presoak – whether it’s the quick soak method or the overnight soak. Then cook them as directed. 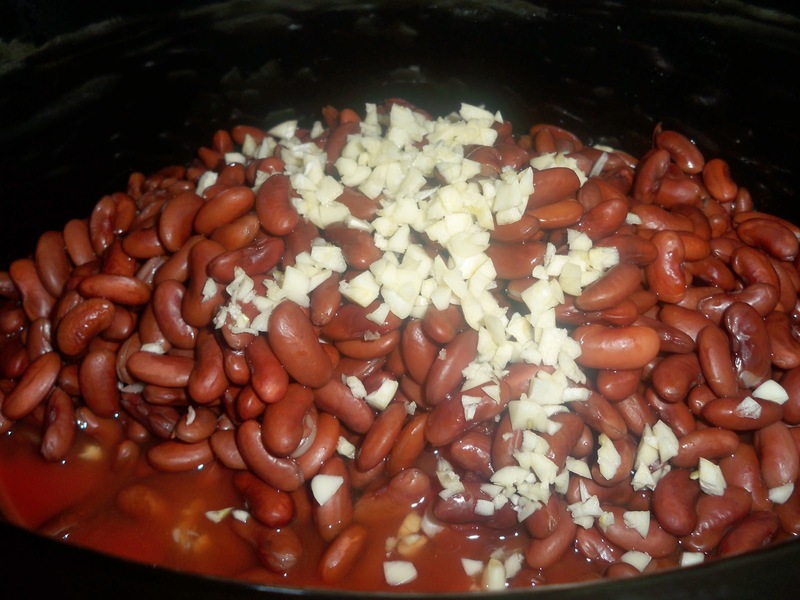 Once rinsed and drained, add the beans to the crockpot with the diced tomatoes, tomato sauce and chopped garlic. 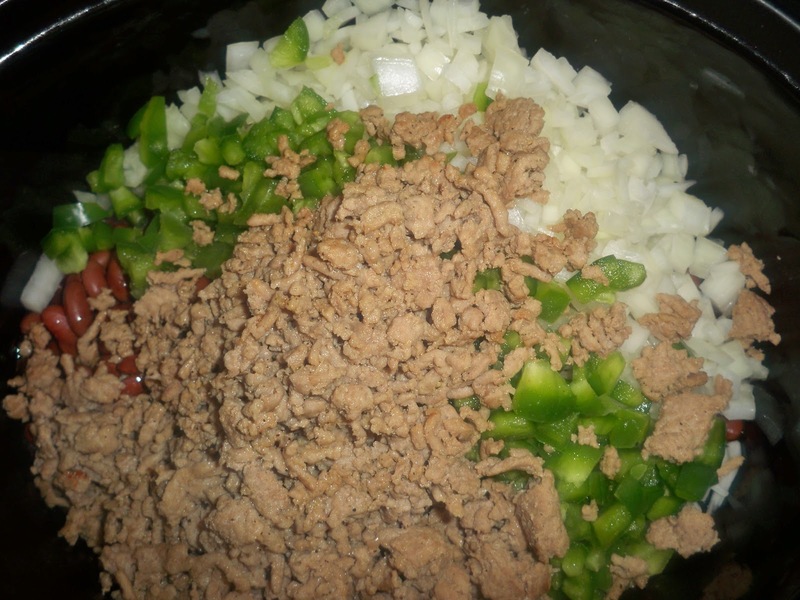 Next, add your chopped bell pepper, chopped onions and can of green chilis. Now brown your ground turkey, and for added flavor I add a few shakes of worcestershire sauce, season salt and lemon pepper while it’s browning. Add the meat to the slow cooker when it’s done browning. Now mix it all up, then add all the seasonings. Mix it again to make sure all spices are evenly distributed. Sometimes I add a little hot sauce for a little extra heat, this time I didn’t. You can do this or play with this recipe. 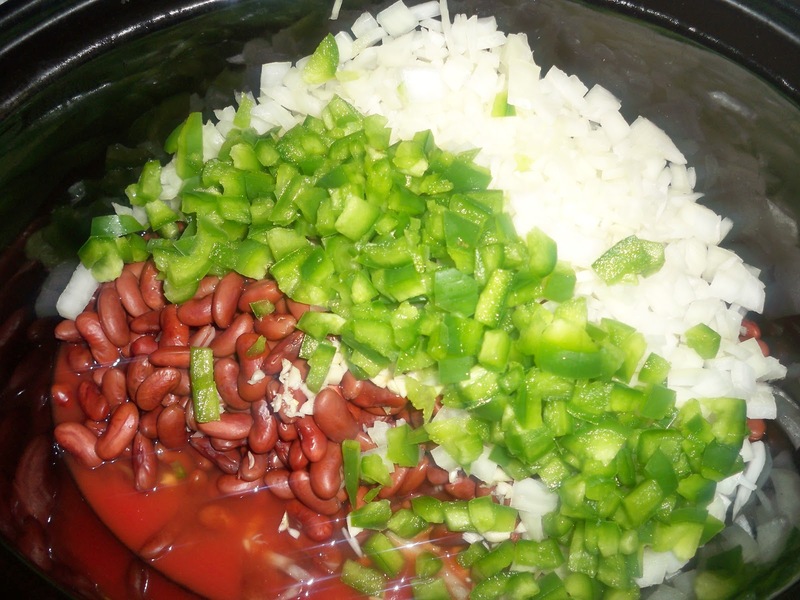 The mixture will be pretty chunky, that’s how we like our chili. If you like yours a little more liquidy you can add another can of tomato sauce. Cover and turn on high for about 8 hours. My slow cooker is oval shaped, so it cooks a little faster than your normal round slow cooker since there’s more surface area for the food. If you have a round slow cooker I’d say leave this cooking for 10+ hours. This is how it will look when done. Another hint, with a slow cooker don’t remove the lid every few hours! The reason the slow cooker works is all that heat and humidity being trapped in there, the moisture is what makes the meats so tender and helps soups and chili get the deep flavor in there. Every time you open the lid you lose about 2 hours of cooking time. Don’t take it off! Now that it’s done, mix it up a bit. It’s going to be hot! It’s great served with some cheddar cheese sprinkled on top, season if needed and a nice thick piece of homemade cornbread. Enjoy! Hi Angela! Yes, I think they were MADE for Chili! Let me know how you like it! Mmmm I made a crock pot chili earlier this year and it was sooo good! 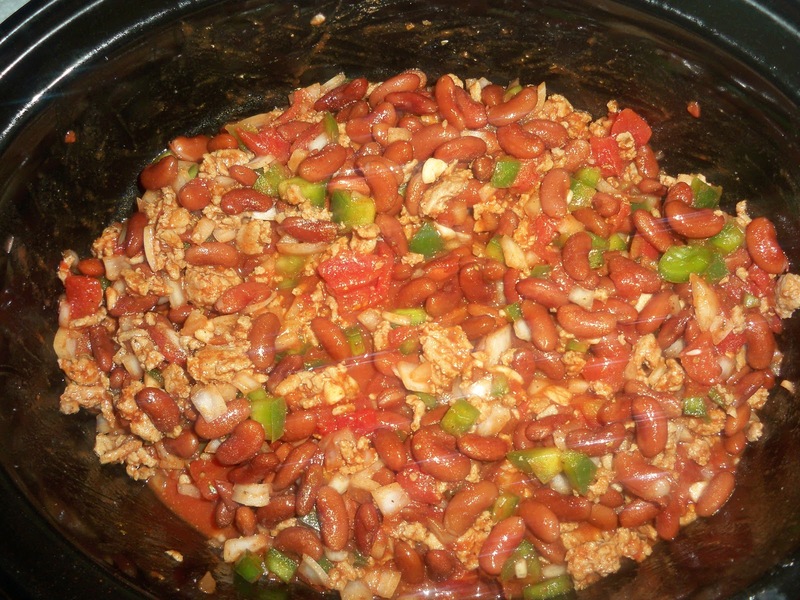 I used canned Kidney beans though – I think I mixed light and dark but it was so good! I need to make it again! I love the crock pot! <3 It's definitely good with a mixture of beans, that's my favorite. Ohh I totally understand that. Milk always does the trick for me with reflux. Thank you lady! Thank you! 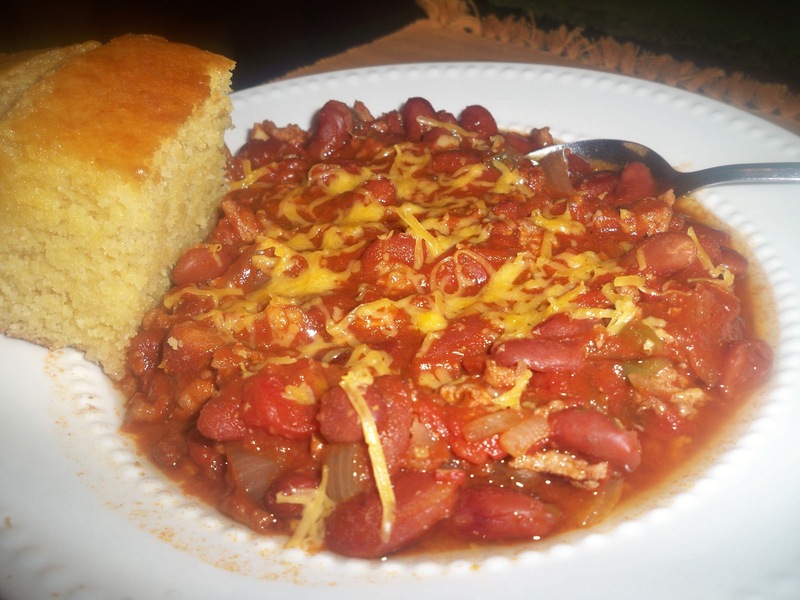 Yes, chili is one of those ultra comfort foods! i’m going to have to try this, looks delish!! Oooh I needed this! Great idea! I use my crock pot so much duh chili!! Haha! Thank you, glad I could help! Yum! I’ll have to share this with the hubs he’s the cook in the family 🙂 It looks so good tho perfect for those cold days where you dont feel like cooking right! Ooh how fun! Let me know if you guys try it! You have officially made me hungry! It’s always cool to see other people’s chili recipes and see the nuanced differences. I don’t think I’ve ever seen a recipe that included Italian Seasoning. How/why did you start incorporating that? Thank you! Yes, I feel the same way when I browse around online at various recipes. So many different ways to make the same thing, that’s when I really see that cooking is an art form, there’s no one way to make anything! As for the italian seasoning, I tend to use it with many tomato based dishes. For me, they just go together so well. It’s one of my favorite spices along with lemon pepper, I tend to use each of them in so many things! It is amazing all the different ways people make chili! Thanks for posting, I’m always curious about other’s recipes. Cooking chili this weekend! Your recipe looks delicious! Thanks for sharing with us! Thank you! I’m a sucker for a hearty chili! This looks delicious! What a great recipe for this winter. Thanks for sharing it at Foodie Friends Friday! !